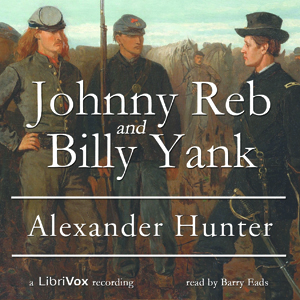 Listen to "Johnny Reb and Billy Yank" on your iOS and Android device. "There were thousands of soldiers on both sides during the Civil War, who, at the beginning, started to keep a diary of daily events, but those who kept a record from start to finish can be counted on the fingers of one hand. I was so fortunate as to save most of my notes made during the four years of conflict, and in 1865, having no fixed pursuit in life, I spent most of the time in arranging and writing up these incidents of camp life while fresh in my memory. I have given in these pages veracious account of the life of a soldier in Lee's army...."
Very boring dull an biased. The narrator was monotonous wouldn’t recommend this to anyone. One of the best written book about the individual soldier and his experience in any war book I have ever heard or read. The Officers on both sides appear to be more concerned about themselves than their men. The Southern officers appear to be more kind and intelligent about the war and their men. I wish more soldiers from this centuries wars from this perspective. Too many writing for gain and not what REALLY happened. Great look at the US civil war. I actually had no idea the south was so close to winning it all several times. Just more proof that politicians only screw things up. Davis was apparently a moron. As a history buff I found this book extremely informative. A true look at the soilders life during this time of war. Great insight on individual battles and the leader of both armies. I finished my book of the month and found this title in the 'free books'. Highly recommended.